Archaeology provides access to the human past, serving as a window into the diverse lifeways and behavior of humans from our origins up to through the present day. This course will introduce you to the principals and methods of archaeology through an exploration of our shared human past. We will begin with the early stone tool technologies of our African ancestors. From there, we will travel across time and space to study the development and spread of modern humans, the origins of agriculture, and the emergence of complex societies. We will debate some of the most contentious issues in human history, including the relationship between Neandertals and modern humans, the significance of the agricultural revolution, and the evidence for why some civilizations fail. We will also consider the influence of modern culture and politics on the study of the past. Our focus will be on how archaeologists study and build knowledge rather than on memorization of facts and dates. My goal is for you to gain knowledge of the diversity of our human past, while building critical thinking skills. For those of you pursuing further study in anthropology, this course will provide the foundation you need for more advanced work. For the rest of you, my aim is to help you buildthe skills you need to critically interpret, understand, and enjoy archaeology as a member of the public. Archaeology is the study of the material remains of the human past, serving as a window into the diverse lifeways and behavior of past humans from our origins up to the present day. Archaeologists have the privilege to study this past and the responsibility to explain when, how, and most importantly, why people lived and behaved the way they did. But how do archaeologists know what they claim to know? What do archaeologists actually do? And why should we care about archaeology or the past? The goal of this class is to help you explore these questions by building your knowledge of archaeological fundamentals and critical thinking skills. To achieve this we will consider the history, goals, principals and methods of archaeology. We will explore how archaeologists collect data in the field, how we analyze these data to reconstruct past human behavior, and the theoretical frameworks that shape this work. We will also consider how archaeology fits into the real world, including ethical issues underlying the practice of archaeology today. Our focus is not on the past itself, but the theory, methods, and ethics involved in studying the past. Archaeology is everywhere. The material remains of our past surround us, but just as prevalent are representations of archaeology in television, comic books, video games, the news, and on film. Pop culture archaeology is both successful and highly controversial, particularly among professional archaeologists. These controversies and contradictions reflect a larger debate about science in modern society and the influences of current events, politics, and social issues on scientific research. At stake are public perceptions of the importance of science and science literacy, both issues of profound importance for our collective future. The goal of this class is to develop scientific literacy through an examination of the relationship between archaeology, pop culture archaeology, and society. We will achieve this through critical analysis of popular representations of archaeology in film, TV, video games, etc. In doing this, we will: 1) learn more about how both real and pop culture archaeologists do archaeology, 2) analyze the relationship between society and science more generally, using archaeological case studies, and 3) develop strategies for communicating archaeological science to the public. This class has no prerequisites and is open to anyone interested in archaeology and pop culture. 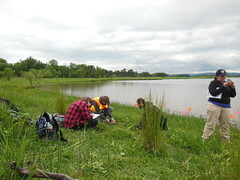 The purpose of this by arrangement class is to provide students with practical experience in the methods and techniques of archaeological lab work. The goals of the class are: 1) to become proficient in post-field activities such as artifact cleaning, identification and cataloging, sample preparation, photography, etc., 2) to conduct basic analyses of archaeological artifacts and samples, including preliminary faunal, lithic, and ceramic analysis, and 3) to understand how these analyses are stepping stones to answering larger archaeological research questions. Students will build skills and knowledge while working with artifacts and samples collected as part of various on-going projects in Northwest Alaska. Some students will also work with collections from the Pacific Northwest. The goal of this course is to introduce students to archaeological lab processing methods and techniques through practical lab experience. The course is a mix of lecture, reading, lab instruction, and lab work, with an emphasis on hands-on learning and practice of skills. Students will engage in a variety of lab activities including sample cleaning, cataloging, photography, bulk sample sorting, radiocarbon sample preparation, and preliminary artifact analysis. 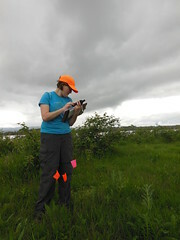 Lab work will involve Anderson’s research samples from northern Alaska and departmental collections from Oregon. Humans have both modified and adapted to our environment over the course of history. The environment plays an important role in cultural evolution, alongside other social drivers of change. In reaching beyond written histories into the remote past, archaeologists are well positioned to study long term human-environment interactions. Archaeological data provide historical context for contemporary political, social, and ecological issues surrounding the interaction of modern humans and our environment. Archaeologists studying past human-environment interactions are increasingly applying their research to current climate change, sustainability, and conservation biology issues. The goals of this course are: 1) to introduce you to the major theoretical approaches and topics within the archaeological study of past human-environment interactions, and 2) to examine modern applications of this research in resource management and other applied contexts. The goal of this course is to build your knowledge of the theory and practice of contemporary archaeological field investigation with a focus on research design and technical reporting. Other topics include advanced field tools and techniques, ethics, and community engagement. Class includes both lecture and a practical component. 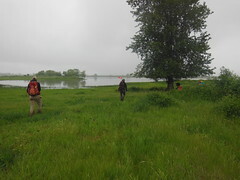 Students are expected to participate in course field trips. This class is an exploration of various advanced archaeological methods through readings, discussion, in class practical activities, lab assignments, and research projects. Topics we will cover this quarter include the application of sourcing methods; dating techniques; residue analysis; radiocarbon calibration, analysis, and reporting. 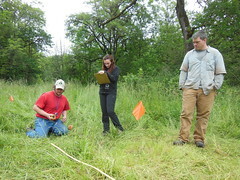 The goals of this class are: 1) to investigate the advanced lab tools, technology, and analytical techniques available to archaeologists, 2) to practice common statistical analyses, and 3) to develop your project design, writing, and data presentation skills. This course is a graduate-level introduction to the history and evolution of archaeology as a discipline within anthropology, with particular focus on contemporary theoretical frameworks. Through discussion and critical writing we will consider how data, theory, and methods are interrelated in archaeology and examine several of the major theoretical topics and controversies in archaeology. We will also consider the relationship between archaeology and modern society, including the ways that society influences theoretical developments. Prerequisites: graduate standing in anthropology and consent of instructor.